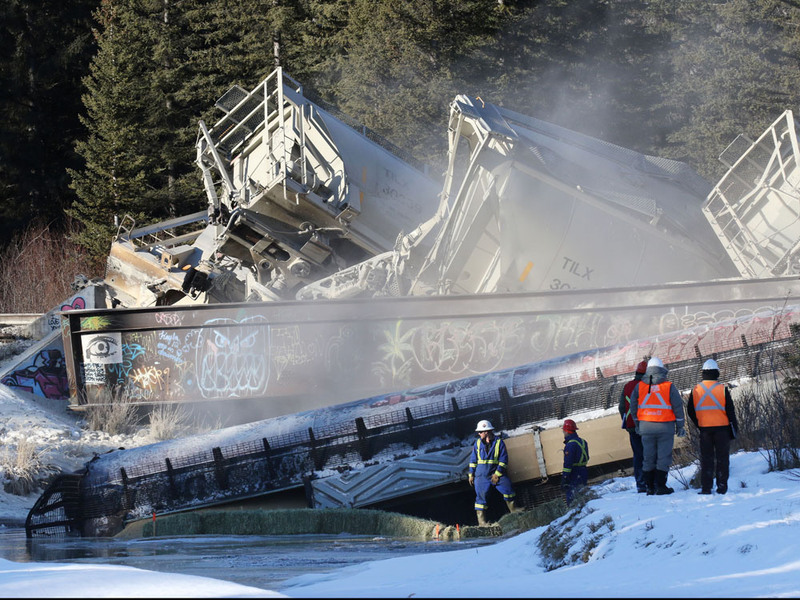 The long-term health of fish may be at serious risk after several hundred tonnes of fly ash, a byproduct of coal production, spilled into 40 Mile Creek during a Canadian Pacific Railway derailment December 26 in Banff National Park (Calgary Herald). The fly ash, when mixed with water, is toxic to fish and other aquatic life. Fly ash contains arsenic, lead, nickel, mercury and uranium, among other materials. Westslope Cutthroat Trout, a species at risk, live in 40 Mile Creek, as do Bull Trout (Alberta’s official fish emblem), Mountain Whitefish and White Suckers. A Parks Canada employee said any fish eggs or other life on the bottom in the creek would have been killed by the fly ash as it settled on the creek bed. Any fish and other aquatic life in the creek would also have had difficulty breathing during the initial spill. Initial reports indicated 7 of the 15 derailed CP cars fell into 40 Mile Creek; now it’s been confirmed that 8 cars fell into the creek, 7 loaded with coal fly ash and one loaded with soybeans. The bridge over the creek was completely destroyed, and a new bridge has been installed. Two train cars remain partially submerged in the water, one of them serving as a makeshift dam to partially block spilled cargo flowing to the Bow River, a short 200 metres downstream of the spill site. A second rock and filter fabric dam has been installed further downstream in an attempt to protect the Bow River from the toxic spill material. Not only is the fly ash toxic to aquatic life, but it can also cause respiratory problems when airborne for humans and wildlife. It is not yet known how far downstream of the spill site the toxic fly ash may have settled in 40 Mile Creek and the Bow River. This derailment and spill of toxic material into a national park creek has once again raised concerns about the transport of dangerous goods by rail.